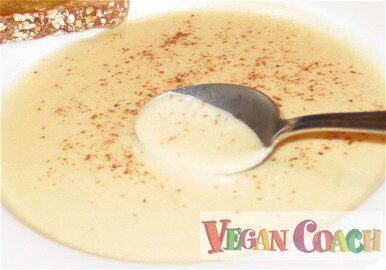 Learn how to make creamy vegan vegetable soup. 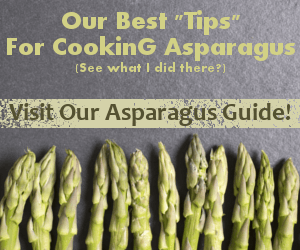 Vary the veggies to make cream of mushroom, broccoli, asparagus, and more! Easy, quick, healthy, and tasty! I picked up a beautiful head of cauliflower yesterday when it was sunny and fairly warm outside. However, today the temperature dove and snow began to fall. There's nothing like chilly weather to signal the start of soup season. And I'm a soup freakazoid, making it every chance I get. 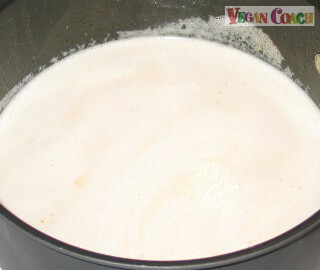 So, it was these snuggly weather conditions that prompted me to create some Vegan Cream of Cauliflower Soup. If you like creamy, rich, and smooth soups, then this is for you. If you don't like cauliflower, simply switch out the veggie for a vegetable that you love, using the rest of these instructions as a guide. 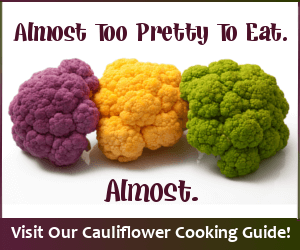 First, clean your cauliflower (or favorite veggie). To do that, simply fill a large bowl with fresh water and add a few Tablespoons lemon juice or apple cider vinegar. Let soak for 10-15 minutes. This foodie acid bath will help to thoroughly clean your veggie of dirt and other things that might be lingering on your vegetable. Cut cauliflower florets from the stem and let soak for 10 minutes or so to thoroughly clean. Drain and rinse. Next, heat 1/4 cup vegetable broth (or a little olive oil) in a large pot. 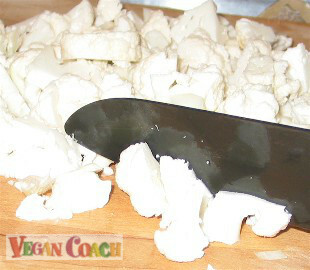 Add one-half of a large chopped onion and one clove garlic. Sauté until the onions are translucent. While waiting for the onions, coarsely chop the cauliflower. 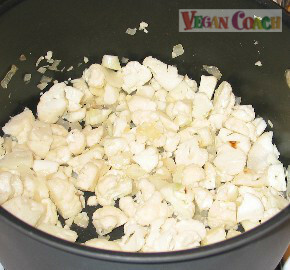 When the onions are ready, add your chopped cauliflower to the pot. Saute for 10-15 minutes, stirring occasionally, until the cauliflower begins to brown. 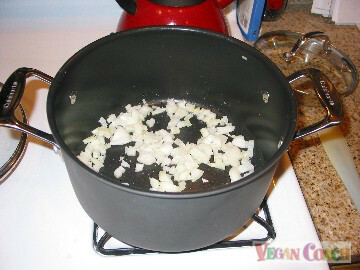 Next, add 6 cups veggie broth (or 6 cups water and 3 veggie bouillon cubes (or equivalent). Add 1 heaping cup of raw cashews (optional but recommended). 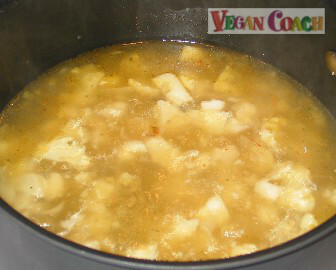 Cover and simmer until cauliflower and nuts are tender, 15-20 minutes more. Pour the contents of the pot into a blender (you may have to do this step in 2 batches or more) and blend until completely smooth. Pour blended soup back into pot. The cashews add some really yummy healthy fats you need, but when blended with a liquid they also help to make this "cream soup" creamy! Now comes the fun part: Let's flavor your soup. Gaze upon the Cauliflower "Vegan Flavor Matches" and add the flavors that you feel would satisfy your tastes. Remember, you can also choose a favorite veggie here to find its unique vegan flavor matches. After adding a few ingredients, stir and taste. Always let the 4 Flavors (Sweet/Sour/Salty/Bitter) guide you in the final tasting of any dish: Does it need some sweetener? Something sour? More of a salty taste? Or does it need a bitter edge? Look through your fridge and cupboards and let your past experience and intuition guide you to the flavors you need to add to balance your soup. At this point, my soup needed a little sweetness, so I added some coconut nectar. When your soup is flavored to perfection, heat gently until warmed throughout. Ladle into soup bowls and garnish with a little nutmeg, or other herb or spice you prefer. This soup makes about 8-10 cups (2 cups each for 4-5 people). Serve with a slice of hearty whole grain bread.